bebop spoken here: CD Review: Beat Funktion - Moon Town. 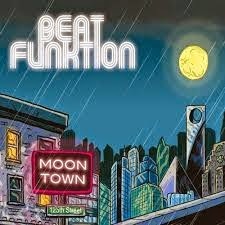 CD Review: Beat Funktion - Moon Town. Carl Olandersson (tpt); Olle Thunstrom (ten); Daniel Lantz (keys); Johan Oijen (gtr); Pal Johnson (bs); Jon Erickssen (dms) + strings, Latin percussion. Swedish jazz funk. The concept is, telling the dark tale of a fictitious sci-fi city oozing with criminality, suspenseful action, drizzling rain and surreal inhabitants - sci-fi? sounds like Newcastle to me! This isn't a CD to sit down and listen to too intently. It's a one to appreciate with your body. A disc to do the Turkey Trot to - or should that read the Funky Chicken? - or whatever fowl things they got up to in 70's discos. Beat Funktion - Moon Town hit the streets on May 21. Jamie Cullum v Fred Wesley October 18. Dropping Bombs @ Sage Gateshead June 28. CD Review: Mike Wofford - It's Personal. James Harrison Quartet @ The Cherry Tree. Last night's Ray Chester concert was recorded! PG4 @ The Star Inn, Newcastle. June 19. CD Review: Brian Landrus Kaleidoscope - Mirage. Djangologie @ Blaydon Jazz Club - June 16. Azymuth @ Hoochie Coochie June 16. This Sunday (June 16). The Toby Boalch Sextet. Slowlight Quartet @ Hexham Jazz Club June 13. Legohead @ The Bridge Hotel, Newcastle..
CD Review: Rik Harris Group - Errands. From Our Man in Hong Kong. CD Review: Nikolaj Hess Trio - TRIO. CD Review: Jacob Varmus: Terminal Stillness.